Can Chocolate Diamonds Change Color? If you're considering a unique stone choice for your engagement ring, you may be wondering, "Can chocolate diamonds change color?" In most cases, the color of chocolate diamonds should remain consistent over time. In recent years, many couples have been seeking out alternatives to the traditional white diamond engagement ring. One popular option is the chocolate diamond, which generally refers to any diamond with brown coloring. These diamonds can range in color from pale champagne to a deep, rich brown. While chocolate diamonds are mined in various parts of the world, the largest producer of these colored gemstones is Western Australia's Argyle Diamond Mine. What Are Levian Chocolate Diamonds? The name "chocolate diamond" is actually a trademark. In 2000, Le Vian, a famous jewelry company, began marketing colored diamonds to the public. They called these stones "chocolate diamonds," and the marketing was so effective that they created a new classic. Cinnamon diamonds are the lightest, a very soft brown with a pale pink and peach undertone. Champagne diamonds are also very light, but they have a golden yellow undertone. Chocolate diamonds are officially a pure, deep brown with no undertones. Cognac diamonds are brown stones with warm yellow, green, and orange undertones. Honey diamonds are also a warm brown, but the undertones are limited to a dark yellow or pale orange color. 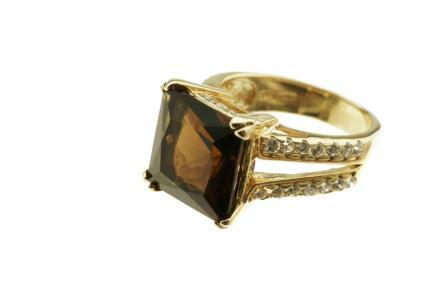 Clove diamonds are deep brown stones with an olive undertone. In most cases, chocolate diamonds are completely natural gemstones. Like white diamonds, these stones were created by a natural geologic process spanning millions of years. High quality, natural chocolate diamonds will always be brown. However, the recent popularity of chocolate diamonds has prompted some manufacturers to irradiate or heat treat lower quality white diamonds. This treatment changes the make-up of the stone, and it often results in a brown color. Over time, treated diamonds can change color. Avoid buying a stone just because it appears to be a good deal. Many artificial or treated stones are passed off as natural brown diamonds, and sellers expect that consumers will jump at a good price. When you buy a chocolate diamond, have the stone examined by an independent source. Unless your jeweler has a solid reputation, it's wise to double-check the authenticity of your purchase. Consider only purchasing stones you can see in person. Buying colored gemstones online can be challenging because computer monitors display color differently. While the stone may appear chocolate on your computer screen, it may actually have undertones you can't see. Now that you know the answer to the question, "Can chocolate diamonds change color," you'll be able to move on to exciting decisions like finding the perfect setting for your new chocolate diamond.